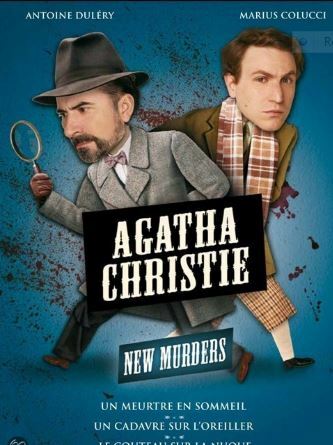 I continue my Hercule Poirot/Agatha Christie obsession with Mhz’ new series of five French TV shows, “Les Petites Muertres d’Agatha Christie” or “The Little Murders of Agatha Christie.” They may be “inspired” by Agatha Christie, but they are not Christie at all. Well, maybe glancingly. But they become their own delightful devertisement nonetheless. Focusing yet again on the renowned fictional creation of Christie’s Hercule Poirot, one of the most famous Belgians ever, “Little Murders” starts by making Poirot as French as French can be. He’s totally transmorgrofied here. Christie’s solitary, probably celibate Poirot,in the French version here is the typically randy rogue, with a roving eye, and he turns out to have a daughter,too! Mille tonneres! It’s a shock to see him portrayed this way. And his Hastings stand-in is Gay! So, of course, I was delighted! And also the very strong and funny performances by Antoine Dulery as LaRosiere, the Poirot character, and Marius Colucci as the piquant, red-headed Lampion, do enthrall and involve you in their own right. They pull you into a world that is not Christie, but Christie-esque.. The period is the same the 1920s-30s . 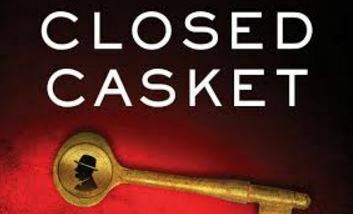 I kept thinking of Sophie Hannah and her two marvelous Poirot continuation novels, “The Monogram Murders” and “Closed Casket” the new one that has just come out and is climbing the best-seller charts as we speak. And he certainly doesn’t have any children, or former wives. He’s a solitary figure, and fussy as hell. He’s really OCD, I think And we love him for being such a nit-picking perfectionist. I can’t recommend “Closet Casket” highly enough and you’ll see how British Christie/Hannah’s Poirot really is. And PS, he hates the British! I always wondered why he has stayed in England throughout all his adventures. In “Little Murders”, Poirot still loves to eat. But La Rosiere will eat ANYthing! He’s a glutton. He’s not picky, like Christie/Hannah’s Poirot certainly is. The five 90 minute segments that Mhz has so marvelously packaged for our delectation state-side really are VERY watchable and as convoluted as Christie’s brain-teasers should be. But you’ll only catch Christie, if you really are a devotee (as I am) because the plots are quite buried if not thrown away altogether by the French creators. I wonder what Christie or for that matter Sophie Hannah would think of this saucy, mistake-prone Poirot. And Lampion is always yelling at his boss! Poirot would never allow ANYone to raise their voices to him! Especially not his side-kick! He’s also always mistaken for being gay, because Lampion is gay. There’s one episode where they end up in the same bed! I loved it! My favorite episode was “Knife in the Neck” which is based on “Lord Edgware Dies.” I don’t want to spoil it, but in the French version there are TWO murder plots a foot, where Christie only had one, and this is one where Poirot’s comely teenaged daughter Juliette (Alice Isaaz) turns up. Poirot has been an absentee father and Juliette reproaches him for leaving her alone to grow up with her (unseen) mother . I can’t even imagine what Madame Poirot might look or be like. In any case, Poirot doesn’t want anything to do with her, or their lovely daughter. But Juliette won’t leave her father alone. She and the droll gay character Assistant Detective Lampion both fall for the same handsome actor, Julien Sobel. Played marvelously by Julien Allugette. There’s even a fantasy sequence where Lampion imagines Sobel doing a strip tease for him! 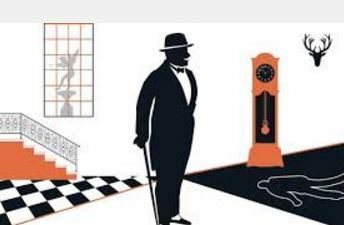 This is not your mother’s Agatha Christie, as you can see by the clip below.And I have to mention the fatalist of femme fatales, Sarah Morlant, a great diva actress, who is based on the Lady Edgware character, but again only slightly. Maruschka Demets does a fantastic, sultry job, huskily purring every line she says, with blood red fingernails, like talons. There’s also several brief scenes of Racine’s “Phedra” thrown in. I loved that. Antoine Dulery and M. Demets were more than up to this classical challenge. 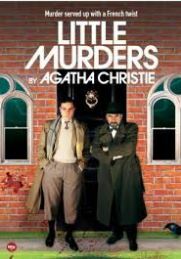 “Little Murders of Agatha Christie” is not what I expected, but I enjoyed it nevertheless.